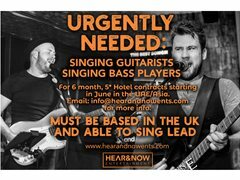 We are looking for talented, hardworking singing bass players with outgoing sociable personalities for 6 month residency contracts at these hotels starting in June. You must be positive, easy going and adventurous, and MUST be able to sing lead vocals while playing your instrument. If you cannot sing or can only sing backing vocals, please do not apply as we do not need normal bass players and you will just be wasting both of our time.